It is said that maultaschen were invented in this part of Germany where I live as a trick to eat meat on Fridays by hiding it in these sort of huge ravioli (my excuses here to any Swabian reading this). Traditionally the main ingredients in the filling are spinach, spring onions, bread crumbs and smoked meat. But it can vary and there are all kind of maultaschen: vegetarian, with ricotta, with potato... Normally they are served either in a soup or fried with butter and onion. 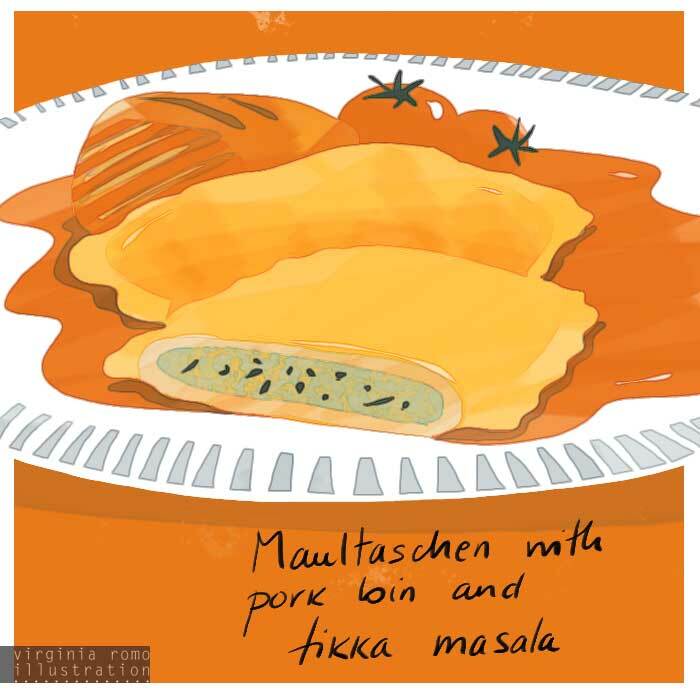 We like them at home, the traditional way or mixed with no so Swabian things as mango chutney or, like today, tikka masala. They go well with many things. The little meat in the filling was apparently not enough and my personal cook decided to accompany them with pork loin. A simple salad to it and voilà, a great lunch that we enjoyed with our neighbours. See with my colleagues at Atelier LaLa cook these days. fancy a cup of tea in my garden?